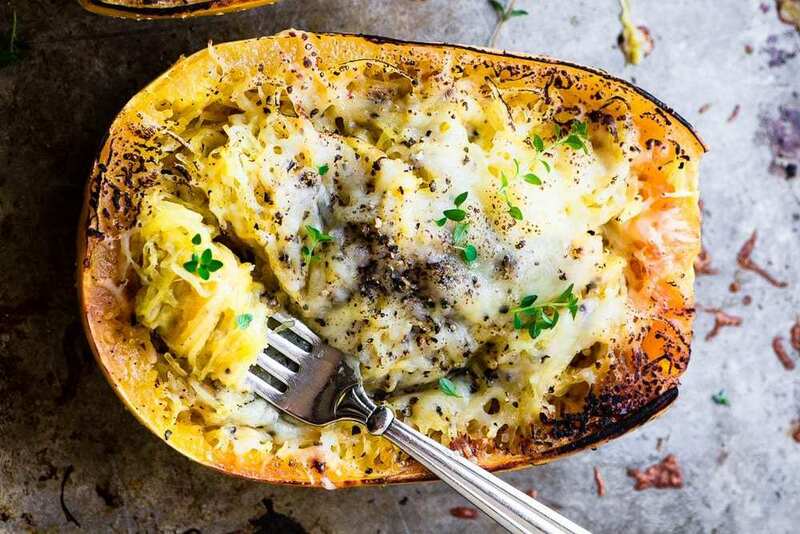 Cacio e Pepe Spaghetti Squash is a deliciously low carb and gluten free version of one of my favorite classic Italian pasta recipes. Preheat oven to 350F Line a baking sheet with parchment paper. Brush each half with olive oil and season with salt. Place cut side down on the baking sheet and bake the squash for about 45 minutes, or until tender. A paring knife should glide in without resistance. Flip the squash over, and let cool for a few minutes. Then shred the squash with a fork to create the spaghetti-like strands. Shred most of the squash, but leave enough along the edges to maintain its shape. Put the shredded squash in a bowl and drizzle with olive oil. Season with salt to taste, and add the pepper. Toss with one cup of the cheese, and then mound the squash halves with the 'spaghetti'. Top with remaining cheese and bake for an additional 10 minutes, or until the cheese has melted.